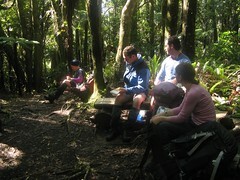 Last weekend we had a nice navigation trip in the Tararuas, along part of Blue Range, organised by Marie and Alistair. It was largely a navigation trip, and was well worthwhile despite persistent rain. Apart from an overnight stop at Blue Range Hut (or camping outside), we managed to spend nearly the entire weekend off-track. Location: Tararua Forest Park, Ruamahanga and Kiriwhakapapa road-ends. People: Marie, Alistair, Patrisha, Richard, Tim and me. Huts visited: Blue Range Hut (1 night). Route: From Ruamahanga Road End up a south-east spur to Blue Range, heading south-west along the ridge to Blue Range Hut for Saturday night. Then up to Te Mara, and down to the South East. Out at Kiriwhakapapa. We spent Friday night in Kiriwhakapapa Shelter, sharing it with another club group, even though we weren’t intending to start from there. It’s not quite as exposed as the Ruamahanga road-end further north, though. The rain was coming down persistently by the time we drove up, and one way or another anyone on the edges migrated further inwards overnight. Eventually the bellbirds began to wake, and some kind of bird that I couldn’t identify began making a lot of noise as it started fluttering around with its nest in the ceiling. Our plan for the morning, after driving slightly further north, was to head a short distance up the track on the true right of the Ruamahanga River before turning straight up a spur, and navigating our way onto Blue Range. Alistair looked up a grid reference for the point at the bottom of the spur we planned to climb up from the Ruamahanga River, and we keyed it into a GPS so we could confirm the approximate point we’d want to head up-hill, just in case there was any doubt. Ideally we wouldn’t need it, though. Ray, from the other club trampey group, was very kind to drive us around from the Kiriwhakapapa Shelter and drop us at the Ruamahanga Road End on Saturday morning, which we finally left shortly after 8am. Perhaps it wasn’t quite raining, but it wasn’t far off. We began by climbing a fence, and this was undoubtedly the climax of the trip until that point. Shortly after this we made our first navigation error, embarrassingly enough as we tried to navigate along the track markers over the farm-land. It did take us to the highest altitude we’d been during the morning to that point, although some mild depression followed once we realised and had to turn back the way we’d come. The Ruamahanga Road entrance to the Tararuas actually has quite a long walk before the park entrance, to the extent that we actually walked for a good hour and 45 minutes before reaching the park boundary. (This, of course, included our unintended detour up a windy farm track, which probably added half an hour.) Still, much of the walk seems to be in a buffer zone between the forest park and the farm-land, which isn’t really farm land. 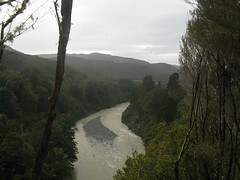 During this walk we could look down to the Ruamahanga River from the sidling track high above, well endowed with muddy flood water, and it was nice to know we’d not need to go anywhere near it in the next couple of days. 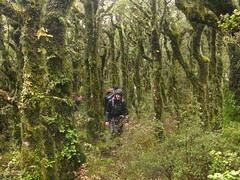 Eventually we passed a sign indicating the official border of the Tararua Forest Park, and the surrounding trees very quickly changed to provide a more consistent canopy over the track. Soon after entering the park, we had our first minor creek crossing, followed by a much more gnarly creek in a small gorge of its own, though there were plenty of hand-holds to get up and around the edges without any real concern. At this point, we were more or less at the bottom of a very nice, direct spur (east of spot-height 635), heading upwards towards the south-south-east, making it fairly straight-forward to plough upwards and be confident of getting onto the main Blue Range Ridge. 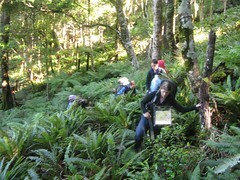 The route up this particular spur is overgrown in places, especially for the first 10-20 minutes. As usually happens, though, it became clearer higher up, and animal tracks along the obvious and a handy deer track developed to make the going somewhat easier. Alistair reckoned he noticed one or two markers, but apart from this we didn’t really see much sign of people at all, although it’d be a reasonable assumption that it’s quite a well walked route. Our lunch stop occurred on the high point of our initial spur, north of spot-height 875, and we stayed until 12.45, then headed along the main part of Blue Range towards the south-west. By now the rain was coming down steadily, but the tree canopy was holding most of it off, apart from all the water settled on the vegetation we had to push through. It’s an okay ridge and certainly not difficult to traverse, but I wouldn’t personally rate it as one of my favourite to walk along. It was interesting though, because it was one of the few ridges I’ve visited so far which felt as if there was much more of an animal track than a human track. I guess people must follow it from time to time, but there wasn’t a lot of evidence of this — Marie found a single ribbon marker tied to a branch on the ground, but that was about all. There was a very nice little track to follow, however, which made good diversions around many obstacles that weren’t always immediately obvious. Animal tracks tend to have good ideas, though, so it was generally a good idea to follow them. I guess my only regret is that deer aren’t about a metre taller. For however much the route was relatively easy-going, everything that hit tended to be about chest and head high, and there was a lot of it. Furthermore, the track would every so often divert into a small space under a big fallen tree, or something similar, which would either require a little pack dragging or some awkward circumvention of various obstacles. Maybe things wouldn’t be so difficult if the New Zealand back-country hosted introduced herds of wild elephants rather than introduced herds of wild deer, but that also wouldn’t be quite the same. We continued to follow the ridge until about 4pm, at which point the bearing carried us into a thick patch of something where it wasn’t quite clear whether it was best to push through it, or sidle around. 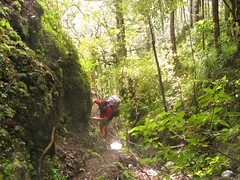 Marie did some investigations pushing through, and after some fighting with a variety of dracophyllum, suddenly emerged onto the short side-track that leads down to Blue Range Hut. And this was the end of the day’s walking. The other group of club people, who’d walked up to Blue Range Hut from Kiriwhakapapa that morning, were happily relaxing and reading in the hut, not very bothered to get out of their sleeping bags as we walked soppily through the door. The first order of business was to get a brew going, which was well worth it. The next order of business was to get a couple of tent flies set up outside, since there wasn’t going to be enough space in the hut to comfortably shelter everyone. Trish, Richard and Tim elected to spend a night on the floor, but Marie and Alistair preferred a Huntech fly outside, and soon after I decided I’d rather have my own space. There are two or three possible tent sites outside Blue Range Hut, but all are fairly thin and not well suited to the tent fly’s we had, and so we put them up on the flat area out the back, partly anchored to the hut’s picnic table. Alistair gave me a hand with my own, and as we were threading the pole through the fly, it snapped, which is never a good sound to hear — especially when it’s raining. It turned out to be not too bad-a-break, though, and very fortunate that the fly would still go up. Still a bit of a pain, but more of a relief that it wasn’t the end of the world. Overall it worked quite nicely, with the only problem being that I wasn’t able to angle my own fly very easily with the wind, and ultimately I nearly lost a peg overnight. No matter, though. Back inside it was nearly dinner time, and Alistair took some glee in smoking out the hut with prime steak for everyone in our group except the two vegetarians (who’d brought some kind of pasta thing). Everyone who’d been hanging out their clothes to dry probably had a meaty scent left on them by morning. Dinner was fantastic, as it usually the case when Alistair’s involved. The rain kept falling, and hadn’t relented at whatever time it was that I wandered back out to the fly to get some sleep. I think it’d stopped by about 2am, although recurring gusts of wind would whip themselves up in the surrounding trees as a threat before descending to the fly. I woke on Sunday to the machine gunning sound of a Whitehead in the upper branches, and noticed that my badly-angled tent fly had nearly lost a peg in one of the front corners. I lay there for a while having discovered it was 6.20am as the occasional light gust caused the corner to flap rather wildly, then decided it might be in my better interests to reach out and try to plug it back into the ground. Optimistically warm morning sunshine glinted through the lower branches, but not direct enough to dry anything out. In the distance through the gap in the trees, Cattle Ridge Hut reflected the Sun’s rays as a bright dot in the distance. sign pointing to Te Mara. 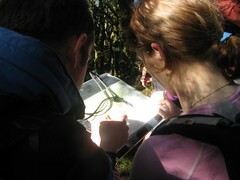 We left at about 8.15am, intent to get back to some more off-track navigation. 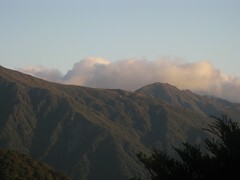 This would begin by heading up to Te Mara — the high point of Blue Range at 1104 metres. Alistair knew of a side-track directly up the spur from the direction of the hut, which I happily managed to walk straight past — doubly amusing because there’s a sign nailed about 2 metres up a tree which I didn’t notice at all. Noticing track markers really isn’t my strong point, I guess. after we made a minor nav error. Te Mara’s marked by a drainpipe in the ground, and it was here that we calibrated some altimetres before navigating down the spur to the south-east, probably about 8.30am or so. It’s a very nice route to follow down, where the bush isn’t too dense, there’s plenty of space to walk, and the ground is comfortably soft. It took a while, though, and there was at least one place where we nearly fell off the spur. There’s a ribbon-marked track all the way up, though, and if we had any doubt we were able to look around for a marker. The route ends on the old bush tram line between the Kiriwhakapapa and Mickey Mickey road ends, right at the point of quite a nice picnic seat. We stopped here for quite some time, had some early lunch at 11.30am, and tried to dry out a few things in the sunshine that was by now beginning to creep through the branches. Sunning on the tram-line route down below. From here there’s just a cruisy walk out along the old bush tram-line route, which gradually descends down to the Kiriwhakapapa Road End. Those in the other group were sitting around in the sunshine waiting for us when we arrived, having been there for about an hour or so. All good. 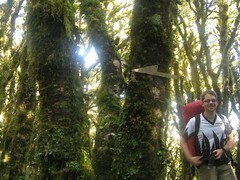 This entry was posted in tramping and tagged bagged:blue range hut, navigation, rain, tararuas, tramping, wellington tramping and mountaineering club. Bookmark the permalink.